If you have a red or brownish mark on your face that you got from a bad zit, it should eventually fade, just like the scars on your knees from falling off your bike as a kid. However, it may take 12 months or longer. So your best bet is to avoid these kinds of marks by not squeezing or popping zits. When you first feel a pimple coming up under the skin apply some hydrocortisone cream with ice applied to the pimple. If you do this as soon as you feel it coming up can help minimize the development of the pimple. At Darlinghurst Dermatology Skin & Laser Clinic you will initially have a consultation with the Dermatologist to properly assess your acne scars. Then the appropriate treatments will be discussed and planned out. It is important to understand that the reddish or brownish acne marks that are left behind after a pimple are not true scars but discolouration and eventually fade with no need for treatment. This can take months up to a year. Picking or squeezing acne can increase the risk for scarring, though. 2. Scars that are deep and narrow (referred to as ice pick scars). 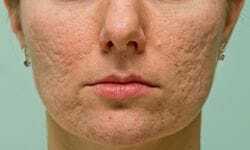 It is important to treat active acne before scars can be treated. Treatments depend on how severe the scars are. Most acne scars require multiple treatment sessions and usually a combination of different treatments. Mild acne scars can be treated with skin care, i.e RetinA creams and chemical peels to help improve the appearance of scarred areas. One of the treatments we use at Darlinghurst Dermatology Skin & Laser Clinic is called subcision. This procedure involves inserting a sterile needle deep into the acne scar dissecting the fibrous tissue. This releases the scar and helps it rise to the surface. The procedure also stimulates the formation of new collagen which pushes the scar to the surface even further. About a year after the procedure, patients and doctors rate up to 50 per cent improvement in the scar. Fillers and fractional laser can be used following subcision to speed up the process. The laser removes the damaged top layer of skin and tightens the middle layer, leaving skin smoother. It can take anywhere from a few minutes to an hour. The doctor will try to lessen any pain by first numbing the skin with local anesthesia. It usually takes between 3 and 10 days for the skin to heal completely. Special dressings may be required. Antibiotics are usually prescribed. Redness can take weeks to months to fade out after treatment. Sometimes lighter treatment of laser resurfacing are used in combination with the fractional laser treatments. Fractional laser resurfacing is a new concept in skin rejuvenation that has revolutionised the treatment of acne scars. Essentially, it induces thousands of micro-punctures to the skin, deep enough to stimulate the old collagen and elastic fibres to self-repair while leaving the surrounding tissue intact. This treatment allows the skin to heal much faster with minimal downtime. It promotes the bodys natural healing process and stimulates the growth of new collagen to create new tighter tissue to replace skin imperfections. Over time, the scar becomes smoother, softer and regains the texture of normal skin. At Darlinghurst Dermatology Skin & Laser Clinic, we use Sciton Profractional Erbium laser. This laser treatment is fast as it requires just one pass across the area. Although some patients report a little discomfort, the skin heals within 24 hours. Patients being treated on Friday can return to work on Monday. The Profractional laser is also effective for the treatment of facial pigmentation, lip and eyelid wrinkles, facial rejuvenation and other surgical scars. This type of treatment works at a deeper level than laser resurfacing. Because fractional laser only treats a fraction of the skin at any one time, healing time is shorter. Someone who has had this type of treatment may just look a bit sunburned for a couple of days. Firstly, it lifts and flattens the scar out, leaving the skin looking smoother and giving a more even surface. Secondly, due to the localised trauma from injection or any filler, the body produces its own collagen, therefore the scars treated with fillers become less deep after the first injection. The filler that we use at Darlinghurst Dermatology Skin & Laser Cliinic are the hyaluronic acid fillers. One or two treatments will usually give 50-80% improvement to the appropriate scars. Treatments are repeated once every 1-2 years depending on the patient. Some patients will require a touch up treatment in six (6) months.